We've been going down to the Jersey Shore several times a year for the past 30+ years. When it comes to my family's vacation time, we love spending it down at the shore. Our favorite coastal towns in New Jersey are Ocean City, Avalon, Stone Harbor, Wildwood and Cape May. Yes, visiting south Jersey is the best in our book! Every time we go down there we're on the lookout for new street art and outdoor wall murals that we haven't seen before. We are HUGE fans of street art and coastal wall murals and have photographed & visited about 30 different ones located around New Jersey. You can find those posts right HERE on our blog and make sure you check out our Street Art & Wall Murals Pinterest board. 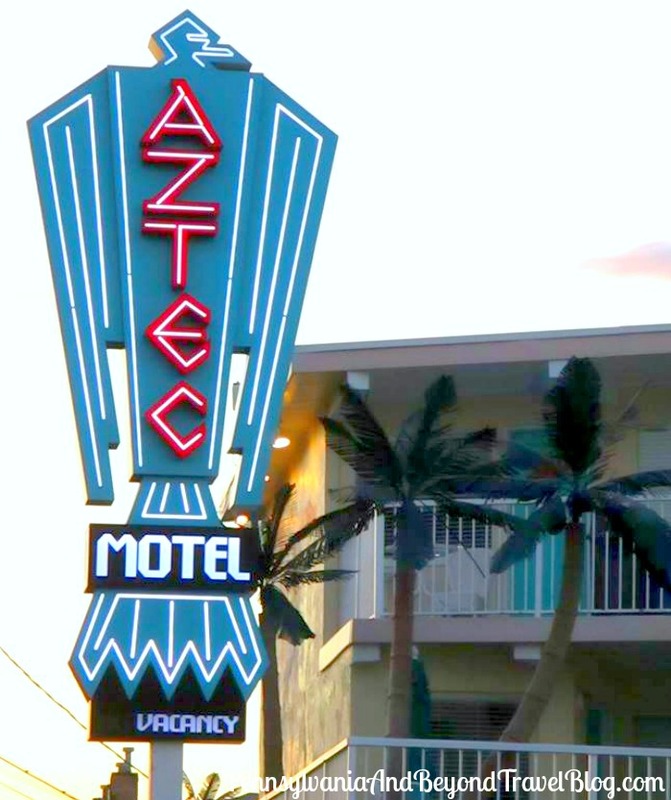 While on a recent trip down to Wildwood in New Jersey, we stumbled upon the Aztec Wall Motel Wall Mural painted on a wall of the Aztec Resort Motel building. If you're unfamiliar with the area you'll find the resort located on Lavender Road in Wildwood Crest. It sits about 1 1/2 blocks from the beach and 2 blocks from the world famous Wildwoods Boardwalk. Like a lot of the outdoor wall murals that you find down in this area this one is done by MG Signs, you'll find the signature in the bottom right corner. Matter of fact, I've counted at least a dozen of MG Signs wall murals on the island over the past few years and documented many of them right here on our travel blog. This one really stands out because most of the wall murals that I've seen in the area are beach, ocean or tropical theme. This one...completely stands out and reminds me of something I would see out west.